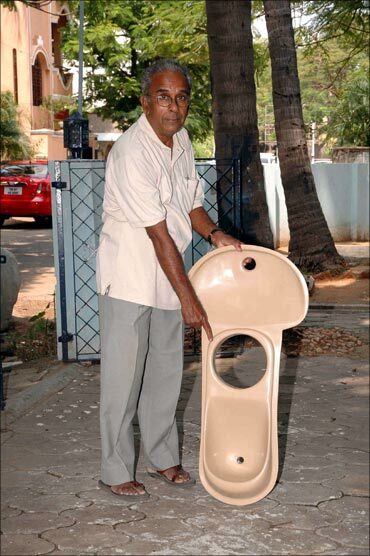 He quit his job as a physics professor to educate the residents of Chennai the importance of saving water. His tireless efforts bore fruit when J Jayalalithaa, the then chief minister of Tamil Nadu made rainwater harvesting compulsory for all the properties in Chennai, a first in India. For his unique efforts in 2003, he was made an Ashoka Fellow ('Ashoka Innovators for Public' was founded by Bill Drayton in 1980 in Washington, DC to recognise social entrepreneurs of the world. Now, it has over 2,000 Fellows in over 60 countries) Ashoka Fellows are selected from all over the world who work at the grassroots level. In 2010, the Harmony for Silvers (founded by Anil Ambani's wife, Tina) selected him as one of the ten recipients of Silver. This time, the award was for his work in the field of sanitation. He was called the Inventor of Ecological Sanitation. Meet 64-year-old Dr Sekhar Raghavan. I am basically a physicist and was working as a temporary professor in the University of Madras for six years. After I left the university job, I joined the Centre for Policy Studies which was a socio-economic research centre. They looked at all that was traditional whether it was agriculture, water management, science or polity. I was asked to visit 150 villages in Chengalpet district to go through the 200-year-old records of 2,000 villages, which was the complete survey of those villages that included the number of water bodies, temples, paddy fields, etc. It was from those records that I learnt about water management. I thought if the so-called 'uneducated' people could implement such wonderful things, why not the educated? 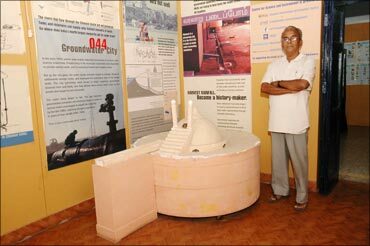 In 1995 I started a campaign on rainwater harvesting in Chennai. 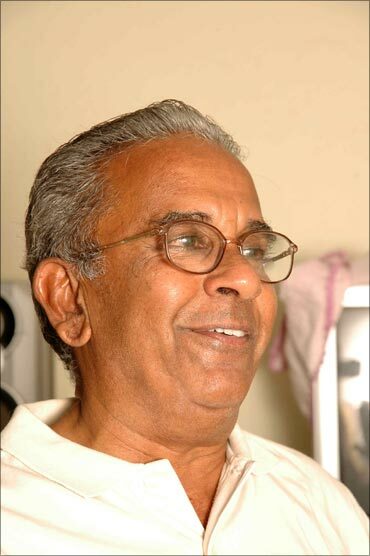 The reason behind my activism was the way water level depleted in Besant Nagar where I was staying for 40 years. Besant Nagar was one area which boasted of good groundwater. With many high rise buildings coming up and people cementing their yards, rainwater stopped seeping down and the water table began to go down. Even educated people did not realise the harm they are doing to the soil and groundwater. 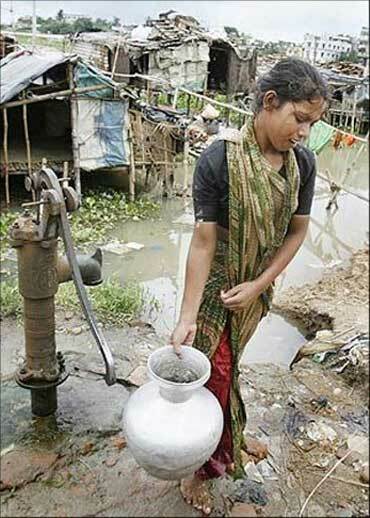 Soon, wells ran dry and groundwater became brackish because of incursion of sea water from the adjacent Bay of Bengal. I then decided to enter the field. I couldn't keep quiet any more. What I did was, I ear marked a street. And on a holiday and Sundays, I visited each and every residential complex to create awareness. They treated me very badly. The watchmen did not let me in as if I was trying to sell something. Despite the humiliation at many places, for three years, I continued with my efforts without much success. I didn't know what to do. In 1998, I approached the neighbourhood newspaper, Adyar Times and told the editor what I wanted to do. In their guest column, I was profiled. Only then did people came to know what I intended to do. Only after that, I was allowed inside apartment complexes. The next trick I tried was, I visited the J Krishnamurthy Foundation school and requested the principal to write letters to all parents in the two areas I wanted to work. The principal wrote to them about my campaign and I was allowed inside the apartments there by these people. Many ask me whether I was disheartened. To tell you the truth, I was never disheartened. I do not know what encouraged me to continue with my campaign. I started a trust in my mother's name after she passed away we printed the first brochure with the money she had left behind. I thought it was my duty to make people understand the importance of harvesting rainwater. Also, there was a selfish motive behind my campaign. As I planned to live here for the rest of my life, I wanted my groundwater to be good. 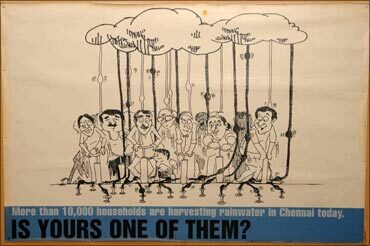 In 1999, The Hindu carried a series of articles on the need to harvest rainwater. 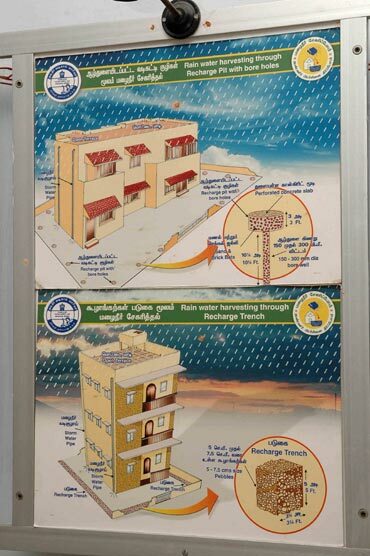 That spread the awareness all over Chennai and I started getting calls to advice them on rainwater harvesting. Two remarkable things happened in 2001. The All-India Anna Dravida Munnetra Kazhagam which spoke of making rainwater harvesting mandatory in its election manifesto came back to power. The then chief minister J Jayalaithaa appointed Shanta Sheela Nair, a committed bureaucrat as the secretary for water supply. She was also a resident of this area. She formed a high-level committee to popularise rainwater harvesting and I was the only non-governmental person in it. Whatever I was trying to do in Chennai was taken to the entire state. The second thing was, Ram Krishnan, an IITian-turned-activist called me from the United States and told me that he wanted to support me in my endeavour. He felt it was impossible for me to go from house to house all the time. So we decided to start Rain Centre in Chennai where all the information about rainwater harvesting would be disseminated. It cost us Rs 5 lakh (Rs 500,000) to set it up. 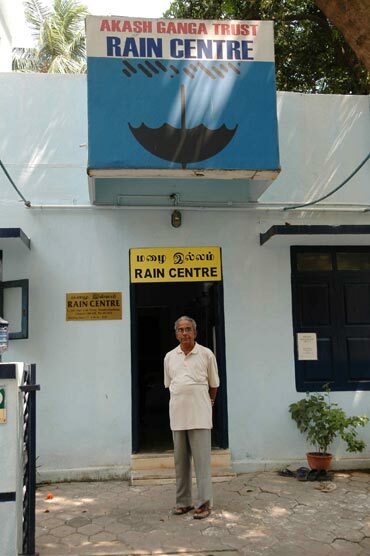 Thanks to Dr M S Swaminathan, in August 2002, Jayalalithaa inaugurated Rain Centre. Because the chief minister inaugurated the centre, it got a lot of publicity. Rediff.com wrote about our centre then and even today, people refer to that article and contact us. An NGO (Centre for Science and Environment) in Delhi got interested in the Rain Centre and they felt every city in India should have one. I can proudly say that ours was the first centre of this sort in the country. They wanted to support us and did the interiors of Rain Centre. We run purely on donations as our services are free. Within two months after the inauguration, Jayalalithaa brought in the law that all houses in the state -- both new and old -- should have rainwater harvesting. 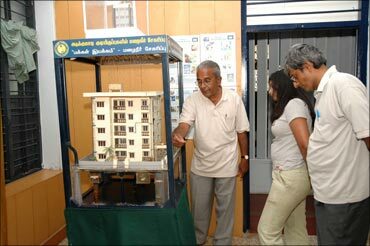 In those days, every day, at least 30-40 people used to visit our centre. This was in addition to the telephone calls. 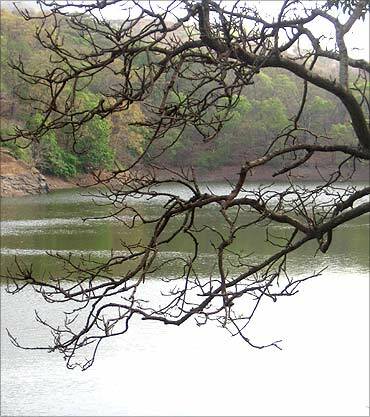 By 2005, after the rains, we found that groundwater had risen by 20 ft which was spectacular. I resigned from my job and became a full time social entrepreneur by becoming the director of Rain Centre. If funds permit, I take a salary, or else, I work free. It doesn't matter now. I am 64. But I must salute my wife who has been the bread winner of the family always. She works as assistant professor of history in a government college. My only son was good at his studies and studied on scholarship; never depended on me. For a social entrepreneur, if the family is not supportive, you cannot do anything. Fortunately, my family supported me all the time. I don't know why I am doing this, but I like my job as a social entrepreneur. In 2005, I was introduced to the concept of ecological sanitation, which is actually composting toilets. A Briton named Paul Calvert who lives in Thiruvananthapuram brought in this concept for the first time. UNICEF organised a workshop in Chennai on this and I got fascinated by the concept. In many small places where there is no proper sewage or drainage, flushed faeces are let into water bodies. Faeces from these pit toilets pollute the water bodies and also percolate into the groundwater. It is very dangerous in coastal areas where water level goes up during the monsoon. 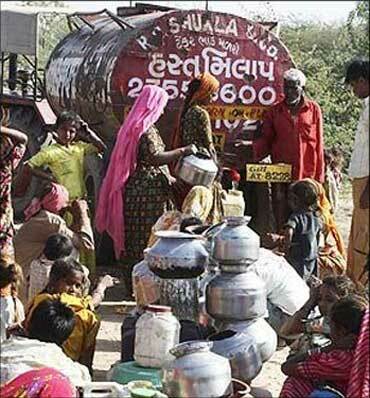 Community wells also get polluted by this. I decided to work in Kovalam, a fishermen's village near Chennai where people depend heavily on wells for water. Pit toilets are also on the rise there. In these composting toilets brought to India by Paul Calvert, urine and wash water go out and ash is put on top of the faeces. Faeces, this way, become compost and can be used as manure. The most important thing is that you don't create sewage and pollute water bodies and groundwater. It was a tough task getting villagers to use it. A Japanese anthropologist happened to see this in Kovalam and got a grant for 70 toilets, and 66 were installed in the Dalit settlement in Kovalam. We have started working in another village now. Composting toilets is the only sustainable thing. These days I get calls from other cities in Tamil Nadu to help them set up rain centres. I also get calls from outside Tamil Nadu, like Jaipur, Mumbai, etc. I got a call from Guwahati to help them rain harvest the Secretariat complex. 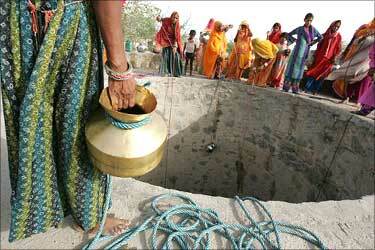 People will think of rainwater harvesting only when there is a scarcity. Otherwise we take water for granted. Desalination is not an efficient method at all. I can understand desalination plants where there is no rain but we have enough water that can be harvested. I am happy with the awards I have received because they take the message to the people. Can Anil Ambani pull his firms back from the brink?